One cool thing about the Word series is that while researching a book, I come across some little scripture nuggets that I've never heard before. A lot of times it's something super weird, only a verse or two long and is buried in chapter upon chapter of laws, rules and guidelines (which helps explain why I've never heard it before). Don't Grab the Secrets (25:10-11) – "If two men are fighting and the wife of one of them comes to rescue her husband from his assailant, and she reaches out and seizes him by his private parts [In the King James, it's "taketh him by the secrets"], you shall cut off her hand. Show her no pity." The fact that this is in there means that this was apparently some type of common problem. Listen to Mom and Dad (21:18-19, 21) – "If someone has a stubborn and rebellious son who does not obey his father and mother and will not listen to them when they discipline him, his father and mother shall take hold of him and bring him to the elders at the gate of his town.... Then all the men of his town are to stone him to death." I think of all those times as a kid where I didn't take out the trash and yet I still escaped with my life! One thing that stood out about the rules of Deuteronomy is that a lot of them have to do with fairness, justice and caring for the poor and needy. The most incredible examples of that is the Year of Jubilee. Basically, every 50 years, all slaves were set free and all land was returned to it's original owner. For the Jews this meant that no one would be a slave forever or permanently lose their inheritance. That's insane! Can you imagine that in today's world? I couldn't find out for sure, but it seems like as cool as the Year of Jubilee sounds, it may have never actually happened. I'm guessing that around year 45 there were some dudes with a lot of slaves and a lot of land that wanted to forget about it. 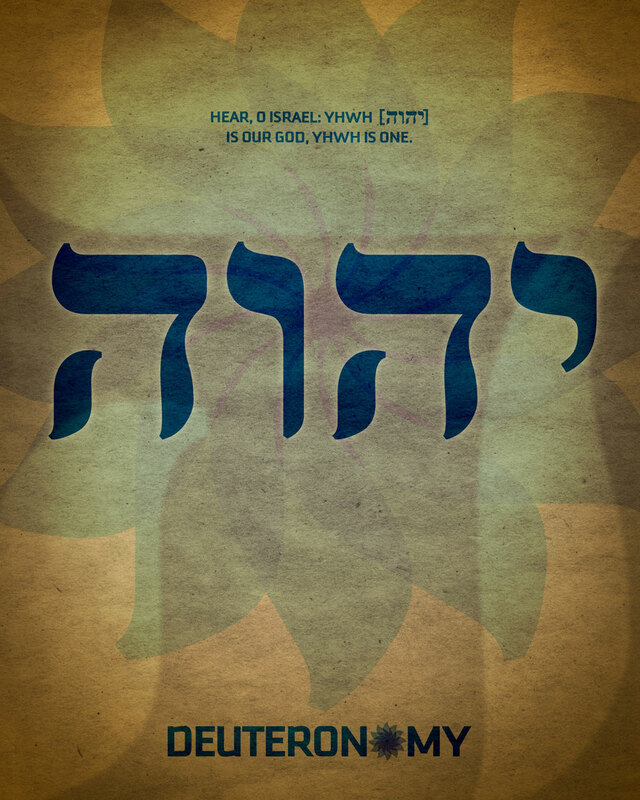 This week's design is based on one of the most important verses in Deuteronomy (according to Wikipedia), Deuteronomy 6:4: "Hear, O Israel: the LORD (YHWH) (is) our God, the LORD is one." The verse constitutes the Shema, a definitive statement of Jewish identity. The term used for God is YHWH (יהוה in Hebrew). I really dug the look of the Hebrew letters and decided to mess around with those.